Molly Tentarelli is a local Singer/Songwriter from Portland, Oregon. She recently released her debut album featuring David Sanborn, Will Lee, Vinnie Colaiuta and more! 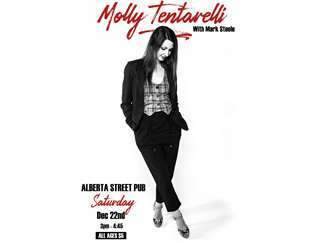 Join Molly Tentarelli and Mark Steele at Alberta Street Pub on Sat. Nov. 22nd beginning at 3pm for an afternoon of original music and holiday classics!